This replica of an overlook located near the artist's home was created for the exhibition as an interactive visual aid, inviting viewers to view the work as one would the natural setting of a wildlife refuge in the wetlands, and inviting them to carve or write their names into the wood. 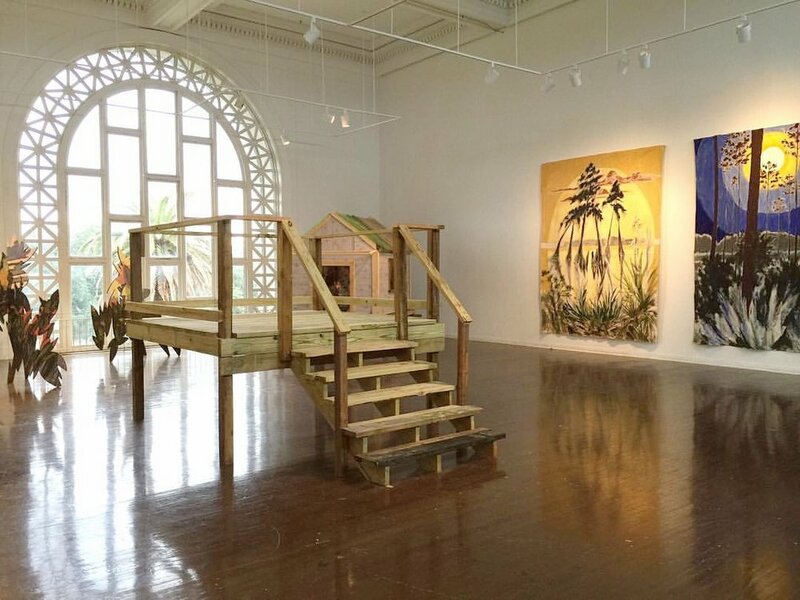 "Sanctuary" on left, represents the artist's personal space for reflection and creativity, and is designed to look like a cross between a miniature hunting camp and a greenhouse. Tapestries on the right, entitled "Twilight and the Dance of Trees", were painted from scenes found in Henderson Swamp and Big Branch Marsh. Depicting trees interacting with their environment, the delicately painted tapestries bring to mind the timeless connection between living things, the sun and moon. These paintings are a selection of works the artist created while documenting her home throughout different times of year. As she learned about nature through understanding her childhood home in the wetlands, she also learned about nature's process, transformation, and renewal. While these paintings were done within 50 miles each other, the varying palettes are affected by what time of year the scene was painted, and at what time of day the artist was painting. Summer, for instance, brings heavily saturated colors, whereas winter makes for a more sparse, cool palette. One might notice there are burn piles and smoke clouds painted in the distance. Burning of the marshes used to occur naturally, and is now controlled by people. While people and animals do not appear in Kaplan's work, the effects of their presence is sometimes documented. Inside the artist's "Sanctuary", there are numerous journals documenting wildflowers and yellow steno pads that chronicle the artist's daily activities and thoughts. Works in progress, vulnerable works, the artist's painting hat, and paint palettes create a miniature version of her Lacombe studio. An old cardinal's nest sits on the windowsill of the sanctuary. Seeing these works from the overlook creates the same feeling as looking out at the marsh. While so much can be seen from the ground, seeing it from above allows the viewer a place of advantage and safety. Here you will also find the many markings of visitors to the exhibition, sometimes carved and sometimes written or drawn. The artist created these wooden sculptures as a way to place works throughout the woods near her house, as an impromptu sculpture park for those who traveled through the woods on four-wheelers. Each surface is painted with a local landscape, and while her work is certainly inspired by Louisiana rural life, her sculptural distillations of landscape appear like surreal shadow forms painted with electric colors. These works are playful, but are large enough to confront a viewer. From living outdoors, the forms begin to warp and deteriorate, bringing the artist's rural aesthetic into play. 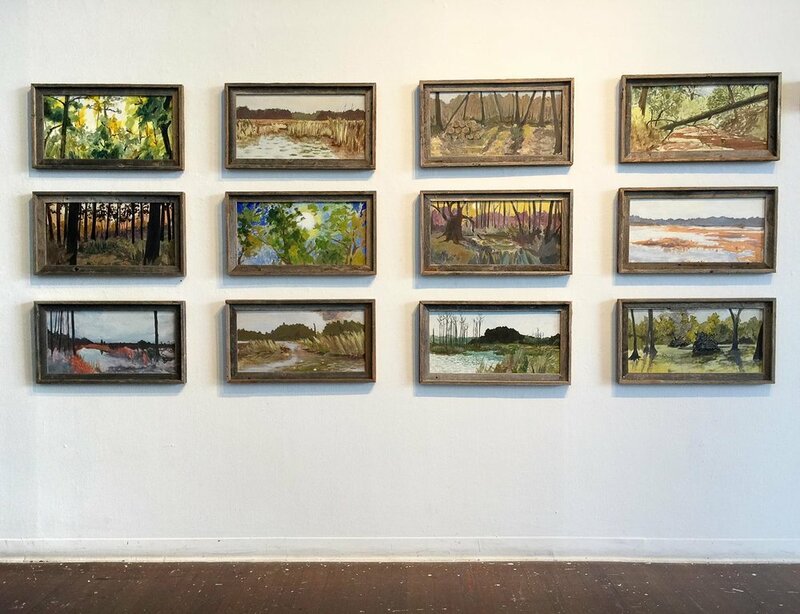 These delicately painted tapestries are certainly driven by the artist's natural gravitation toward graphic symbolism, her connection to the landscape of Southeast Louisiana, and her study of the behavior of trees. Trees lean upon one another for support, stand together as they are possessed by the moon, and reach out to one another in a way that makes them almost human. Artist Mia Kaplan talks about her exhibition "Twilight and the Dance of Trees" at Isaac Delgado Fine Arts Gallery in New Orleans, Louisiana.